Discover the cannabis strain that's right for you! 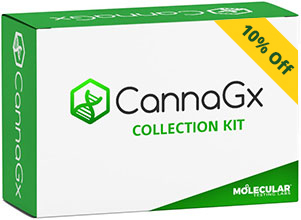 Cutting-edge cannabis dosing guidance derived from your genetic code. Please allow 3-5 business days to receive the test by mail. The DNA test is sent to you directly in the mail to complete. Test results are only shared with you. You are free to share them with whomever you like. Our company stores your results in a digitally secured and HIPAA compliant database, just like your doctor or hospital. When future products are released, more insightful reports will be available, often without submitting additional DNA samples. The manufacturer and this website do not provide refunds for the DNA test that are either past 30 days of the date of purchase or after the results of the test have been posted to your account. Tests are transferable to another person, if the original recipient of the DNA test did not complete. By purchasing this testing, you are agreeing to these terms. You must be 21 years of age to use this site. The contents of this site are for informational purposes only. These products are not intended to diagnose, treat, cure or prevent any disease. The efficacy of medicinal marijuana or hemp-derived cannabidiol (CBD) products has not been confirmed by Food and Drug Administration (FDA)-approved research. The content of this site is not intended to be a substitute for professional medical advice, counseling, diagnosis, or treatment. Always seek the advice of your physician or other qualified health provider with any questions you may have regarding a medical condition. Never disregard professional medical advice or delay in seeking it because of something you have read in this site. You are responsible to know and adhere to your State’s laws (you assume all risk in reviewing this website and complying with your State specific laws) and regulations regarding marijuana use and related activities (operating a medical or recreational marijuana business, selling, cultivating, using, possessing and distributing marijuana) all of which remain illegal under federal law.